The ocean is green on this Ocean Raft Tour. Weird. When you come to Skagway, you may notice that the water is green. That’s weird. In every other port, the water is bluer and often very clear. Why is Skagway’s ocean water so green? That’s a good question, which is why this blog exists. Today, we are going to figure out why the ocean is so green in Skagway. If you’ve traveled around a bit, then you know that the ocean can be all sorts of colors, depending on where you go. If you’re in the Caribbean, the ocean is a very beautiful, clear, aquamarine color. That’s nice. If you’re in a boat way out in the Pacific Ocean, the water can be a deep blue or gray slate color. If you’re in Tampa, the ocean is brown and nasty looking. Tampa is not very nice. So, what’s with the green water? If you came to Skagway in the winter, the water would not be green at all. During that time of year, the ocean is a very deep blue color and crystal clear. However, in the summer, the ocean is bright green and that’s just crazy. As glaciers carve into mountain rock, fine sand is created. That sand is called silt. Glacial silt. It’s very fine, almost like pumice, so it stays suspended in water for some time before sinking. You may not know this, but the river that flows through Skagway is called the Skagway River. It’s not a very creative name, but there you have it. There are a number of glaciers that flow into the Skagway River. When it warms up in the spring, the glaciers start to melt and the silt suspended in the glacier flows into the river along with the melt-water. That silt is an off white color, but when it mixes with river water, it reflects green light, which is why the river and the ocean appear to be green. You aren’t kidding! There is so much silt in the Skagway River that it turns the ocean green. However, the silt is only dense at the top of the water column. If you were to peek down into the ocean, you would discover that the water is clear only a few inches below the surface. That means that fish, whales, and other sea critters can see just fine below the surface, but you can’t see them. We hope you enjoyed this informative blog about silty ocean water. Whenever you see strangely colored water in Alaska, you can bet that it’s silt-related. Isn’t nature something? 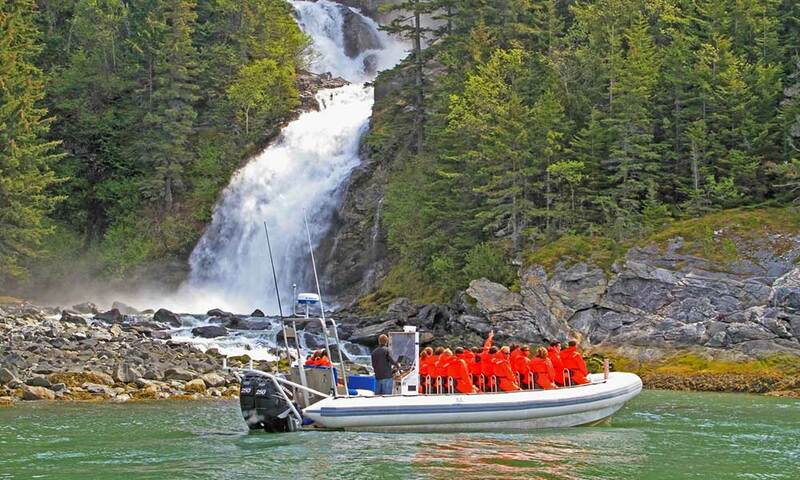 Kid friendly tours in Skagway How is the camping in Skagway?